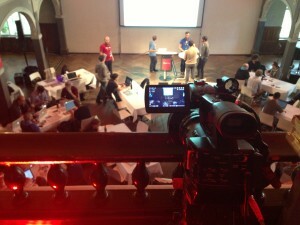 For all of you who are interested in the video recording workflow used at Reject.JS and CSSconf.eu in Berlin, September 2013: Here is a short wrap-up. 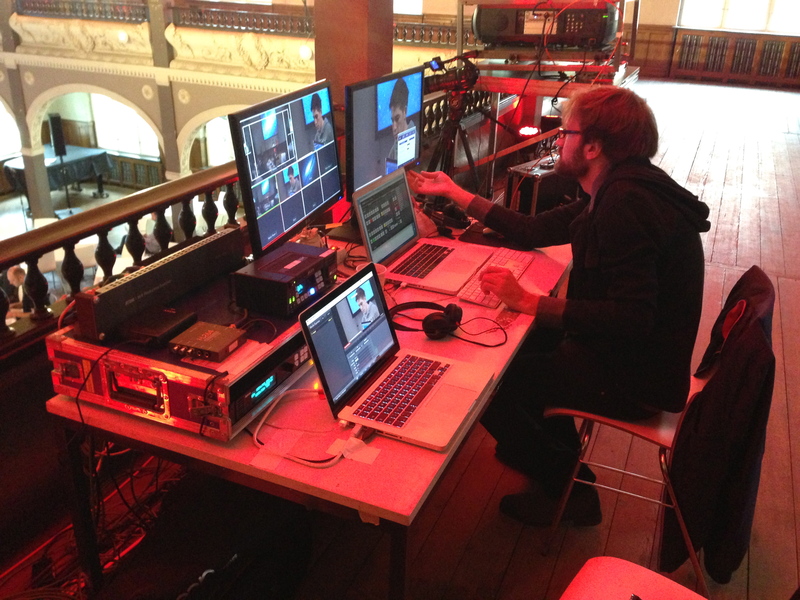 We recorded and edited all talks live, so they were ready to be uploaded right after the event. No editing or post-production (inserting lower-thirds, corner-logos, intro-slides) was needed. We used a video mixer to switch between three different sources: Two cameras and the live capture from the presentation laptop of the speakers to show either slides or live coding examples. 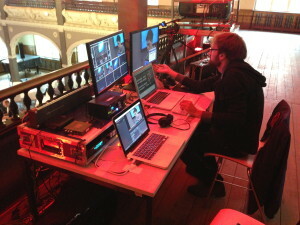 One camera was operated while an intercom enabled the communication between the live editor and the camera operator during the talks. This means that the live editor was able to tell the camera operator exactly which images or movements he needed. Audio was provided by decibel Sounds, who did an amazing jobin providing us with a nicely leveled stereo mix (headsets, handheld mics and sound embedded in presentations). The stereo mix was then embedded in the video stream via SDI. We simultaneously recorded a H264 quicktime file (720p, 8Mbit/s, 48khz) as well as a ProRes (61Mbit/s) file. The H264 was trimmed and uploaded to Youtube. The ProRes recording was used as a backup and to enable re-encoding for special purposes or to use the high-quality footage for e.g. for editing a trailer later on. We had an awesome time recording the talks. Thanks to the Reject.JS & CSSconf.eu team for their trust and cooperation! If you want to work with us, please get in touch!